During the early 1960s Arthur Boyd developed a strong interest in the myths and literary themes of ancient Greece. In particular he became fascinated with the story of 'Lysistrata'. This ancient Greek comedy by the playwright Aristophanes was originally produced in Athens in the spring of 411BC. In the play Lysistrata ('dismisser of armies') is an Athenian woman who negotiates an end to the war between her city-state and Sparta. She accomplishes this by persuading the other Athenian women to refuse the conjugal rights of their husbands until peace is achieved. The women take possession of the Acropolis and the treasury in the Parthenon, and with support from the women of Sparta and other enemy states, successfully force a conclusion to the war. Boyd chose to focus on one of the female dissenters as she stealthily escapes over the walls of the Acropolis in the dead of night to keep a rendezvous with her waiting husband. Symbolically, they are near the cave of Pan, the ancient god of love, underlining a typically Boydean theme of conflict between opposing forces: in this instance anti-war idealism and sexual desire. 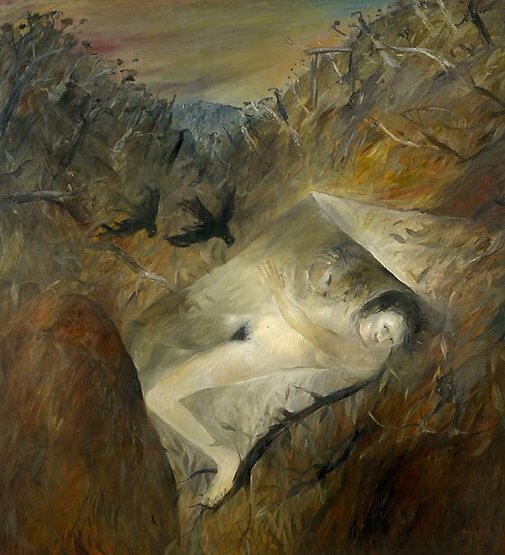 Arthur Boyd: Art and life , 'Experimentation: Graphic work', pg. 116-129, London, 2000, 129.